When it comes to flooring, stone is very similar to ceramic tile and can be used anywhere tile can be used. 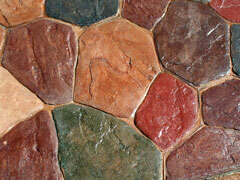 Stone has a more rough-hewn look than tile and is distinctive because of its natural colors and interesting veining. 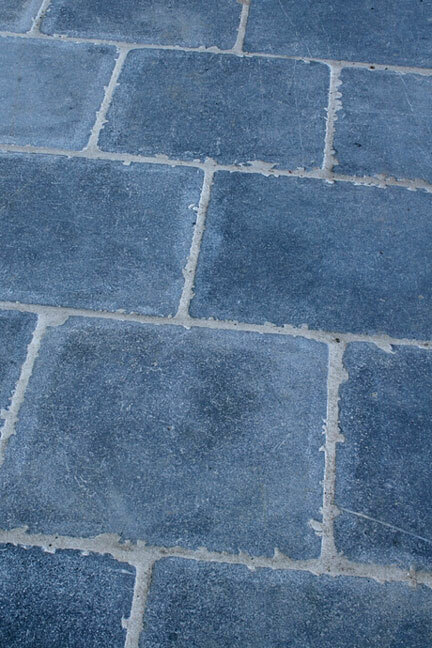 There are many types of stone used in flooring. The most popular stones are limestone, marble, and granite. Limestone has a smooth surface and can be white, yellow, gray-black, or brown. Marble is veined and can be black, cream, red, or white, as well as green, gold, gray, or pink. Granite is mottled and comes in hues ranging from salt-and-pepper to rust tones to black. You will usually want a professional to install a stone floor, but if you decide to tackle the job yourself, check out these instructions for installing a stone floor. One thing to keep in mind is that because of the heavy weight of the stones, you will need a well-supported subfloor. In addition, because of the varying thicknesses of the stone, you will need a thick cushion of mortar. Dirt and grit do the most damage to a stone floor, so keep area rugs at the entrance to your home to keep abrasives to a minimum. Dust mop your floor frequently with a clean, untreated, dry dust mop. For more extensive cleaning, use a pH-neutral detergent or stone soap; do not use vinegar or lemon juice. For more information about stone floors and stone floor care, visit the Stone World website, which features a good selection of online and print resources. To protect against staining, you should apply an acrylic sealer to your floor immediately after it is installed and once or twice a year thereafter. Also, blot up spills immediately.